Our MMA class is for everyone! We have professional and amateur fighters and they meet at special times (not listed on schedule). 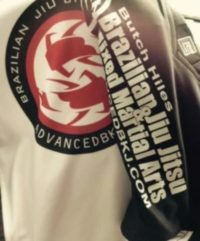 However, we suggest that people who want to learn real MMA attend our BJJ, boxing, and other classes so they can learn each aspect of MMA faster. The class is geared for all training levels. We have fighters, youth, women, and men all in the same group. Many couples and families take this class together, so come try it out and see what all the talk is about! For our serious competitors, there are separate classes designed for those who are getting ready for professional or amatuer events. Those days are designated as “Advanced days” on our schedule or at the gym. However, as stated, this class is NOT just designed for fighters. This is a class that allows every individual to achieve the same training and health benefits that a fighter does when he trains for a fight. It is an intense workout that you cannot find anywhere else. There is no other workout like it. What separates this class from a fighters only workout? When a fighter is getting ready for an actual fight, there is a lot of sparring involved. This class is not designed to be that kind of class. We have days that are set aside for sparring only sessions. This makes it possible for competing fighters and non-fighters (like our wives, etc) able to workout together without pressure to do something they don’t want to do. We also set aside additional time at the end of these workouts for the competing fighters to do some extra work and sparring after everyone else leaves. As we stated, the goal of this class is to allow EVERYONE the ability to train MMA, and allow everyone to have fun and get in shape. You won’t be disappointed!